We may occasionally hire other companies to provide services on our behalf, including, but not limited to, handling customer support enquiries, processing transactions or customer freight shipping for domestic and international shipments. Those companies will be permitted to obtain only the personal information they need to deliver the service. holster Thailand takes reasonable steps to ensure that these organisations are bound by confidentiality and privacy obligations in relation to the protection of your personal information. 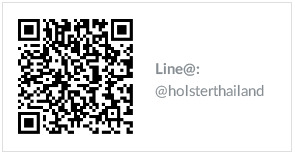 holster Thailand does not sell or rent our clients’ names, addresses, email addresses or other personal information. You have a right to access your personal information, and you may change your personal information at any time by accessing the website. If you would like us to delete your online account, please email customercare@holsterthailand.com. holster Thailand takes reasonable steps to ensure personal information is accurate, complete and up-to-date. If the personal information holster has is inaccurate please change that information by accessing the website or contact us and we will do it for you. holster Thailand takes reasonable steps to preserve the security of information sent to them. If your browser is suitably configured, it will advise you whether the information you are sending us will be secure (encrypted) or not secure (unencrypted). holster Thailand regularly reviews developments in security and encryption technologies. Unfortunately, no data transmission over the internet can be guaranteed as totally secure. Accordingly, although holster Thailand strives to protect such information, we cannot ensure or warrant the security of any information you transmit to us and you do so at your own risk. Once we receive your transmission, we take reasonable steps to preserve the security of the information in our own systems. holster Thailand makes every effort to follow industry standard security measures to prevent the loss, misuse, unauthorised disclosure and alteration of the information under our control. All financial information is encrypted during transmission, and holster’s databases are accessible only to its employees, agents or consultants. When you click on links and banners on our website that take you to third-party websites, you will be subject to their privacy policies. While we support the protection of privacy on the internet, holster Thailand cannot be held responsible for the actions of any third-party websites. From time to time you may receive direct marketing communications from holster Thailand. The facility to either opt out electronically or to email us at customercare@holsterthailand.com to request removal from our mail list database is available to you. Some of the pages on the website use ‘cookies’, which are small files that may be placed on your hard disk for record-keeping purposes. Like an IP address, a cookie helps holster Thailand remember who you are. Cookies can make future visits to our website seamless and simple. You can set your browser to notify you when you receive a cookie, giving you the chance to decide whether or not to accept it. However, by not accepting cookies, some web pages may not display properly or you might not be permitted to access certain information. Once holster Thailand receives information from you, via email or any other means, this information is held in a secure environment.